Home / SURPLUS, military and civilian. / MIlitary surplus by country. / Finnish Army Bread Bag, WW2 model, unissued, original. Original, unissued and very hard to destroy. 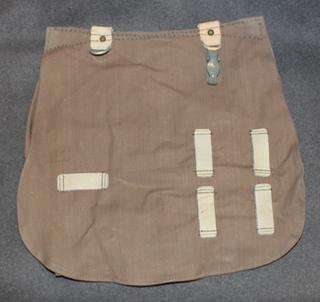 The finnish Army breadbag has been around as long as the finnish army, it is very similar to german Brotbeutel, but finnish version has more loops for leather utility straps. The bags we have now are mostly made in 1960s or early 1970s, there are multiple manufacturers, Satanahka, Savotta, Jousi Tuote, and various others, bags are in fine condition, they have been in storage for several decades, some storage dirt/dust is mandatory. The bags are supplied without shoulder strap, but check out our inventory for the original ones. Also we usually have original leather utility straps on stock. Great piece for those who wish to have ww2 type Finnish uniform. Due the variations, the color of leather and bag may not be exactly same color as in pictures. The logo in picture belongs to Satanahka, it is found only in some of the bags.